With a love for creativity and a passion for hands-on crafts, KionCloud found themself intrigued with the idea of cosplay when it was first introduced into their life. 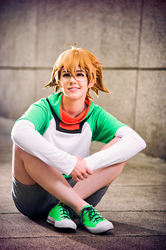 Kion began their own cosplay journey in the autumn of 2013 about a year after discovering the exciting new hobby. They enjoy honing their skills in the many artistic aspects of cosplay encompassing making costumes, creating YouTube videos, as well as in-person performances in front of audiences. While attending several cosplay and Japanese cultural conventions throughout Washington and Oregon, Kion has participated in many live events including cosplay chess and several in-character panels. In addition to enjoying the various facets of cosplay they also strive to be a positive influence in the cosplay community and enjoy the interactions they have with their followers on social media platforms such as Instagram. KionCloud loves meeting and seeing new faces so don't hesitate to say hello!